How can I suspect apnea in a bed partner? Awakenings gasping for breath. This latter symptom is not that common. Some individuals exhibit bruxism, or teeth clenching or teeth grinding. Some have excessive drooling, decreased libido, and morning headaches. Am I at risk or is someone I know at risk? Individuals with a family history of snoring or apnea are at increased risk of apnea. Men are at increased risk compared to women. Individuals with large neck circumference (size 17” or larger) are at increased risk. Individuals with large tonsils are generally at increased risk. Post menopausal women are at increased risk. Those who drink alcohol at bedtime are at increased risk. Individuals with recessed or small jaws and other craniofacial abnormalities are at increased risk. What symptoms can Sleep Apnea cause? Can sleep 10-12 hours and still not feel rested. Hypertension, diabetes, and sexual dysfunction. 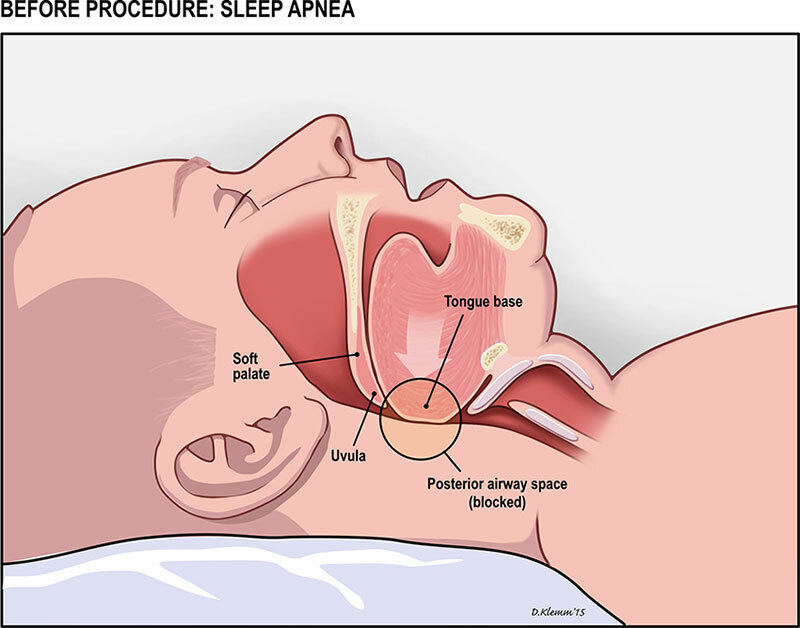 Apnea is caused by an obstruction of the upper airway, the area above the voice box or larynx. It is not caused by a problem below the Adams apple or voice box. The most common areas of airway obstruction involve the base of tongue region (back part of the tongue), and the soft palate. We do not snore during the day, and neither do we have apnea during the day. However, while asleep, we are lying down, and the tissue at the base of tongue and palate becomes relaxed and loses tone. Tissue flops backwards, mechanically obstructing the airway. During these periods of airway obstruction, air ceases to enter the lungs, and fresh oxygen is temporarily not being delivered to the lungs. The oxygen level can drop, contributing the symptoms associated with apnea. What factors contribute to Apnea? Obesity is associated with apnea. The majority of patients with apnea are overweight, and weight loss can lessen the severity of snoring and apnea. Individuals with a body mass index (BMI is a relationship of height to weight in Kg/Meter squared) above 27Kg/M2 are at increased risk of apnea. Certain medications can contribute to apnea including muscle relaxants, narcotic pain medications, anxiety medications, and sedative sleep medications. Alcohol can also contribute to apnea. All of these substances relax the muscles, promoting airway obstruction. Hypothyroidism, or a low thyroid hormone level can increase the risk of having apnea. Neuromuscular diseases: certain neuromuscular diseases including certain muscular dystrophies, ALS or other muscular weaknesses can increase the risk of developing apnea.